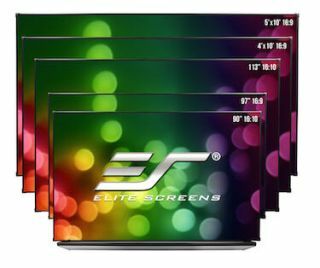 The What: Elite Screens recently launched its new line of whiteboard projection screens. The Whiteboard Screen-TE or “Thin Edge” classroom projection screen combines the two powerful classroom visual aids by providing theater-grade imagery and a dry-erase writing surface within one package. A standard whiteboard is ill suited to be a projector screen. Between surface glare and distracting color shift, regular whiteboards impede the instructor’s attempts to present a clear message. The Whiteboard Screen TE provides superior picture quality free from glare and with total color neutrality. This ensures students see the picture as intended. The Whiteboard Screen-TE’s thin-bezel design provides greater functionality with an increased surface area as well as a more aesthetically pleasing appearance. The What Else: The Whiteboard Screen TE is the latest in Elite’s line of whiteboard-projection screens designed to work with today’s standard short throw, and UST projectors. It uses Elite’s Versawhite dry-erase material over a magnetic backing. The Versawhite material is made of a 1.1 gain matte white projection surface that gives clear color reproduction and a wide viewing angle for limitless training/classroom applications. The material is coated with a scratch-resistant optical nanotech resin. This allows the screen to also serve as a dry-erase board. Lastly, the whiteboard is Greenguard certified for indoor air quality compliance. This certification guarantees that this product meets the strictest safety requirements for indoor air quality emissions. The thin-bezel design serves two purposes. Its 5mm edge protects the screen’s exterior while allowing the instructor to maximize presentation space. It also has a pleasing aesthetic that still supports a utility tray. Also referred to as an accessory tray, it has a stout design that not only holds all the dry-erase essentials but can act as a support for various interactive whiteboard accessories on the market today, in effect turning a projection surface into a large interactive video display. The Bottom Line: The Whiteboard Screen TE is available through all consumer electronics sales channels. This includes online as well as brick-and-mortar facilities for the specific use in classroom and business training facilities. Available sizes range from 90-inch, 97-inch, and 113-inch in either a 16:9 or 16:10 aspect ratio in addition to 4-foot by 10-foot and 5-foot x 10-foot classroom sizes.